So today boys and girls, we will be looking at WORMS! Shall we start with a song from my mother's répétiteur? hope they don't have germs!" The above song, children, shows that one should never pout around my mother, otherwise, you shall hear this song, too! I AM A WONDER WORM! 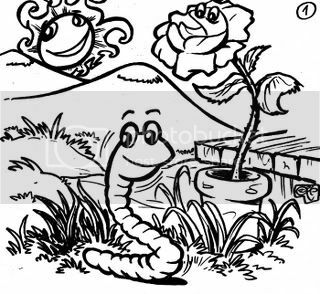 There are over 4000 species of earthworms but only 3 are considered composting worms. The common names for these three are the "Red Wiggler", "Blue Wiggler" and the "Tiger Worm". 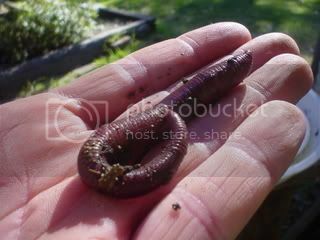 Eisendia Fetida is the proper name for the "Red Wiggler" and this worm is more familiar to us in the States. The Eisendia Fetida has been found to be capable of transforming huge quantities of garbage into something very valuable. They have a very big appetite and can eat 1 to 1 ½ times their weight every day. The "Red Wiggler" excreta, known as "castings", and the washing of the worm urine, known as "worm tea" contain plant growth regulators and other substances. This makes them nature's most remarkable form of bio fertilizer and bi-pest agents. Your "Red Wiggler" population can grow very rapidly. 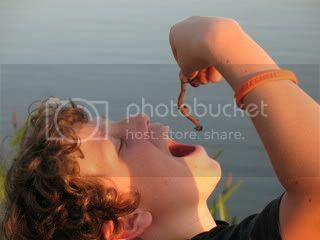 When worms breed, both male and female have reproductive organs. During mating, two worms align themselves in a head to tail position. A thick layer of mucus is produced and the two worms aligned discharge sperm cells, and then separate from each other. One of the first things Marina learned about years ago when I began to formally teach her was about worms and worm castings. And now I have the honor of teaching this all over again with Sierra. I always tell my (small) friends that we should put the worms back in the ground, so that way we can find them again tomorrow. :) I work at a daycare, btw.